Artek's first collaboration with Konstantin Grcic, who designed a flexible home/office chair that references the pressed plywood language of Alvar Aalto. Very civilized coffee service at Karimoku New Standard gallery installation in Brera (plus new table by Scholten & Baijings). Trust the Danish to design a minimalist speaker upholstered in Kvadrat fabric. 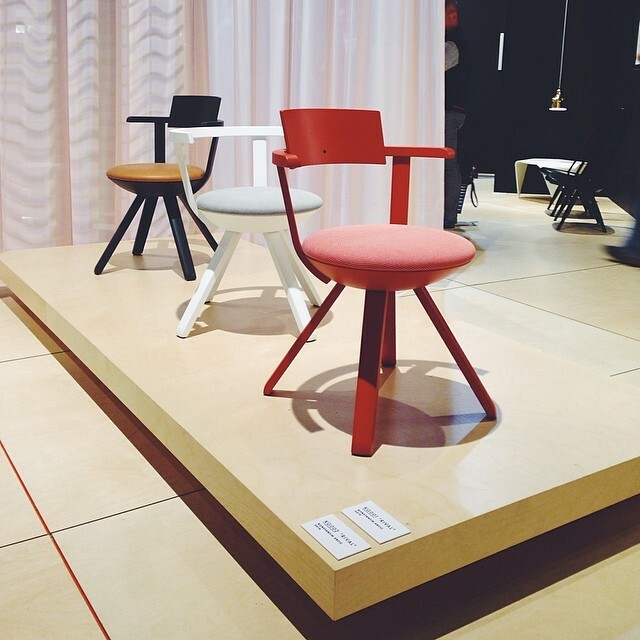 The Norwegian duo Vera & Kyte exhibited in this year's Salone Satellite. Check out more of their work in Dwell's May 2014 issue. Day Four of our tour of Milan Design Week includes some familiar faces, like Konstantin Grcic, who has designed a new chair for Artek, as well as such up-and-comers as Vera & Kyte (whom you can read about in our May 2014 issue). Follow Dwell on Instagram to see all the best Milan finds.